Well, things only keep getting Nefertiti. In case you missed the relatively inconspicuous announcement a while back, Damn You Autocorrect now has shirts for sale. While Jesus Crust! and I am Asparagus! 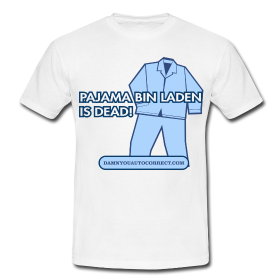 are classics, I think my favorite is the questionably tasteful but undeniably hilarious Pajama Bin Laden is Dead!. If you've been living under a rock and don't know of the brilliance of DYAC, check out the autocorrects to which the shirts refer here, here, and here.